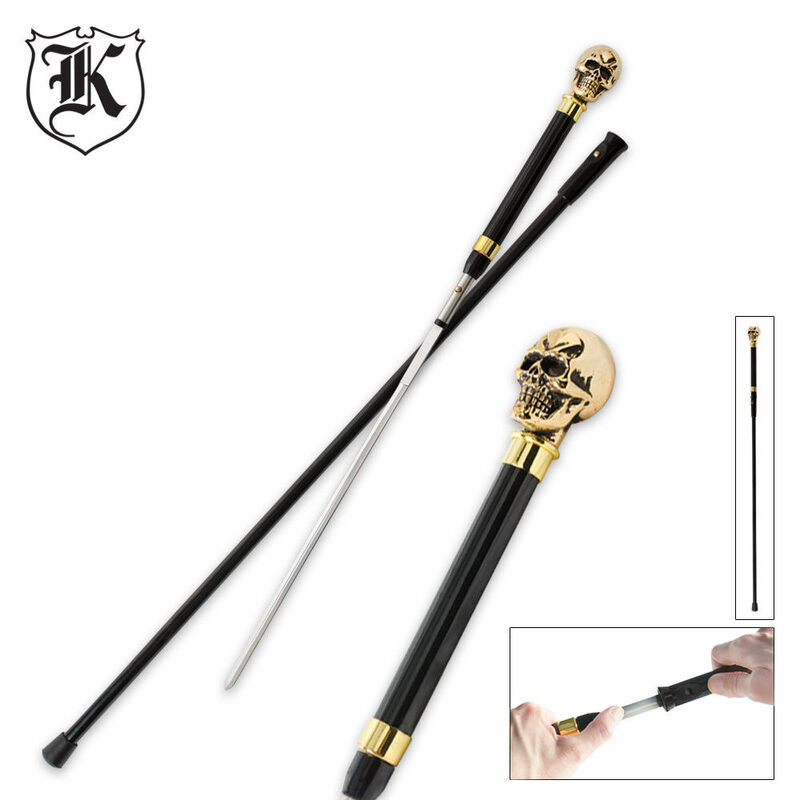 Sleek and stylish, our Polish Brass Skull Sword Cane has been designed with an ultra fast opening mechanism. Just push the blade release button and pull to reveal the stainless steel blade hidden within! Standing 37 in. tall, this piece is topped off with a highly detailed skull grip and matching brass accents. The shaft is finished in black and features a rubber tip for added traction. I guess I got my $20 worth. Blade has no edge what so ever. Does have a true spear point for simple thrusting. Tried to use it on the grinding wheel on my drill and it flew out of the handle. Brass release button is a bit revealing. Some black enamel took care of that. Same with the chipped place below the head piece. Some gloss black touch up and looks fine. Head is smaller than I would like, but not too small to use. I'm kinda tall and the length is perfect. Cane is much more supportive than it looks, taking all my weight if I lean on it. Brass finish is nice. Skull head was secure and I got some nice comments when I use it. 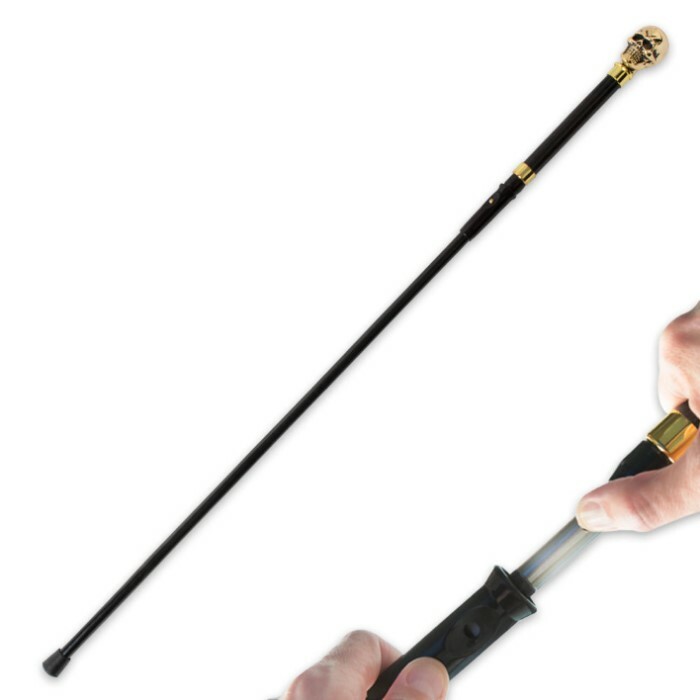 For my 20 I got a nice workable cane, kinda dressy with the brass/gold look. But useless as a sword cane. 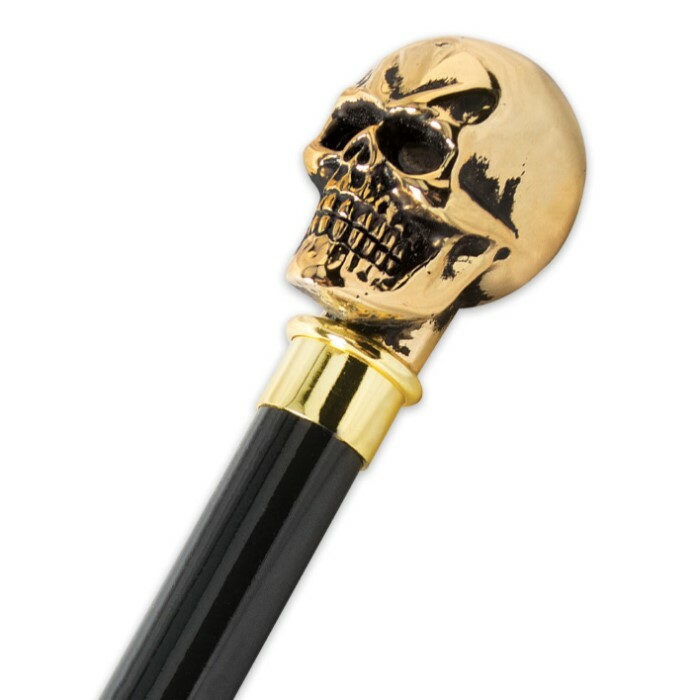 The brass skull walking sword cane is good looking and functional. The price is right,delivery time was great,and it really does look good. I have many health problems ans tire out quickly when walking, this cane will not only help me out when I need something to lean on, but is also an incredible conversation piece. I find it to be well made and durable, the sword hidden inside is top notch. I love this cane sword and I love Bud K, I highly recommend both. Yet again, another winner for top quality and reliability. The weight, the look and the performance are top tier! This cane is a must! The skull sword cane came out of the box with the skull detached from the cane. ( Not glued on well ). I epoxied the skull back onto the cane. The blade was suppose to have a spear point mine did not ( More rounded than a point. . There is no edge what so ever on the sword. I do not expect much from a $19.95 Cane sword , so I got what I expected. On a positive note , it is a nice looking cane and the defects are easily corrected.